A battle is a face off between the 2 sides: the attackers are on the left and the defenders on the right. Each side can heave multiple generals, as well as defences and garrisons stationed by their masters. 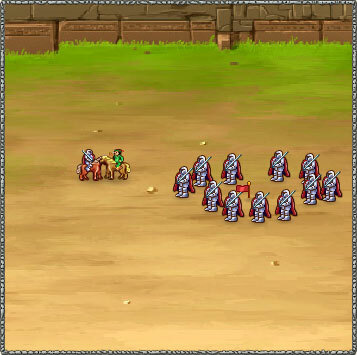 Depending on the size of the smaller of the two sides, a certain number of units fight a duel in the centre of the battlefield (one single duel in the example on the right). Each group has health points which indicate their health level. Click on each group's flag to view their details and their health level. Depending on each group's bonus, each duel will end with the death of one party. The surviving troops will then rejoin their camp without recovering their health points and another duel is started automatically between two randomly selected sets of troops from each camp. The battle is won when one side doesn't have any more troops. All troops are then healed and recover the majority of their health points. If the attacking side wins, they become the master of the location where the battle took place. Tip : Your general can flee a battle before it's finished. If he flees from battle, he'll leave behind any injured troops and also those still engaged in battle.